Home » Air Transport » INSIGHT: Will Russia’s upgraded aircraft fleet lead to price wars? INSIGHT: Will Russia’s upgraded aircraft fleet lead to price wars? The average age of Russia’s aircraft fleet has slipped from 11.2 years at the start of 2016 to 11.6 in 2017, largely as a consequence of rising leasing costs due to a weaker ruble, observes Andrey Kramarenko, a leading expert at the Institute for Transport Economics and Transport Policy Studies at Russia’s Higher School of Economics. The average age trend is likely to continue in the coming years. The average age of units received in 2016 – excluding the re-deliveries of the aircraft previously operated of the defunct Transaero – is 6.5 years. But, with the ex-Transaero aircraft included, the figure jumps to 8.5 years. This compares to just two years ago, when the average age was only 4.5 years and is a trend which suggests a favorable future at least for the Russian MRO [maintenance, repair and overhaul] industry. The figures illustrate that Aeroflot remains the principal airline to receive new aircraft, while other Russian operators acquire brand new aircraft only occasionally, and the coming years will see no change to this trend. In the future, ex-Aeroflot airframes will likely be transferred to its subsidiaries and in particular to S7 Group, the country’s second largest carrier. The fundamental structure of aircraft imports has remained largely unchanged for several years, with Airbus and Boeing contributing some 70% of the total airframes received. The remaining 30% consists of regional aircraft, with that sector experiencing a market share surge in demand for Russia’s Sukhoi Civil Aircraft Company (SCAC) over the past few years due mainly to governmental incentives. Although it is expected there will be no significant changes in the deliveries pattern in the coming years, if the ruble continues to strengthen making the tourist flow cross over from domestic destinations to international, then the demand for widebodied aircraft will start growing. 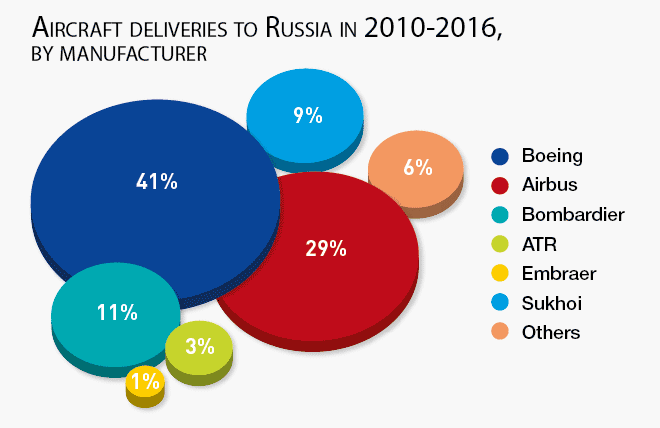 According to ATO Sourcebook, Russian carriers operated only 79 such aircraft last year, against the previous 58 and 90 in 2015 and 2014 respectively. Moreover, with the strengthening of the ruble, some airlines might consider newer aircraft operations. Apart from the 79 widebodied aircraft, Russian airlines collectively operated 463 single-aisle and 348 regional aircraft movements at of the end of the previous year. Kramarenko reveals that Soviet-era aircraft carried only two per cent of the passengers, with approximately 90% carried by Airbus and Boeing aircraft, thus rendering the overall Soviet aircraft replacement potential almost complete. He notes that, in 2016, the Russian market returned to the capacity growth numbers of middle pre-crisis levels, when airlines were collectively receiving about 100 aircraft per year. “Last year 80% of the new capacity was subject to mechanistic, uneconomic pricing strategies, a development that will likely mean that, in 2017, airlines will be forced to fill their fleets or leave aircraft on the ground with all the corresponding losses,” he stresses. Speaking on Russian airlines’ fleet growth rate forecasts for the 2017-2020 period, Kramarenko stresses that if Russian airlines adhere to the rational market policy, “we can expect net fleet growth of about 30-40 airframes of any size per year”. However, despite the mass aircraft phase-out of the previous years – during which almost 20% of the country’s total capacity was removed – operators have nevertheless ramped up their aircraft capacity too quickly. “This is an irrational capacity management stance whereby the carriers have started hastily buying new aircraft to meet the demand – instead of calmly making money steadily”, Kramarenko warns. The worst-case scenario could lead to a fleet growth of 50-60 airframes (phase-out numbers not included). Preliminary estimates show that, despite the end of the economic recession, Russia’s GDP in 2017 will grow by 0-2%, with passenger consumer demand likely to grow by 2-3%, substantially less than the anticipated aircraft capacity growth. The previous years’ scenario – with a 15% passenger traffic growth – “might only lead to price dumping”. The indicators are that the market situation will strongly reflect on Aeroflot remaining the biggest player and on its policy towards its daughter company Rossiya which, in 2016 together with Vim Airlines, introduced the most aircraft. “These airlines are most likely to be the main drivers for excess capacity generation next year and maybe in the coming years and this will result in price wars among the airlines and also between airlines and the rail services”, Kramarenko adds. The largest Russian operator is readying for a new round of price wars, having willingly or unwillingly combined Rossiya with the defunct Transaero airlines. 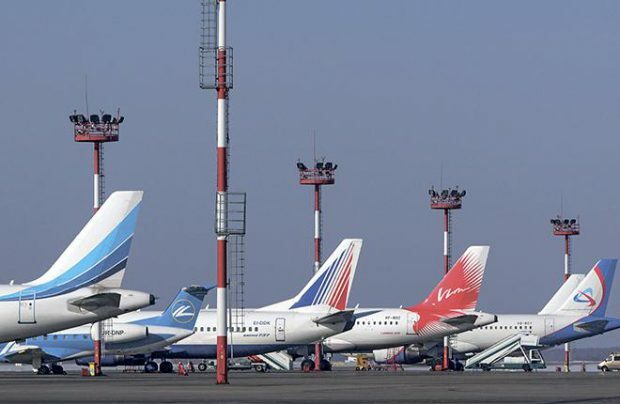 Valery Okulov, Russia’s Deputy Minister of Transport, has said that the average aircraft acquisition rate among Russian operators is about 60-70 airframes per year. With substitutions included, the average annual number of deliveries is estimated at 75-85 aircraft. Two thirds of these units are either in the 50-110- or 140-220-seat categories. Up to 2035, it is expected that Russian airlines will collectively receive up to 2000 airframes, of which up to 1300 will offer mainline services. Meanwhile, according to the United Aircraft Corporation, the next surge in demand for wide-bodied aircraft is expected in seven to 10 years. According to Engineering Holding, Russia’s largest MRO provider, the country’s wide-bodied and long-haul fleet will almost double by 2020. The company also expects that carriers will phase out all Boeing 737 Classics over the next five years. Russia’s Ministry of Transportation notes that the world trend for the average aircraft lease period now stands at 7-12 years. This is because new-generation aircraft have longer key check intervals, a factor which will also influence developments in the Russian aviation market.